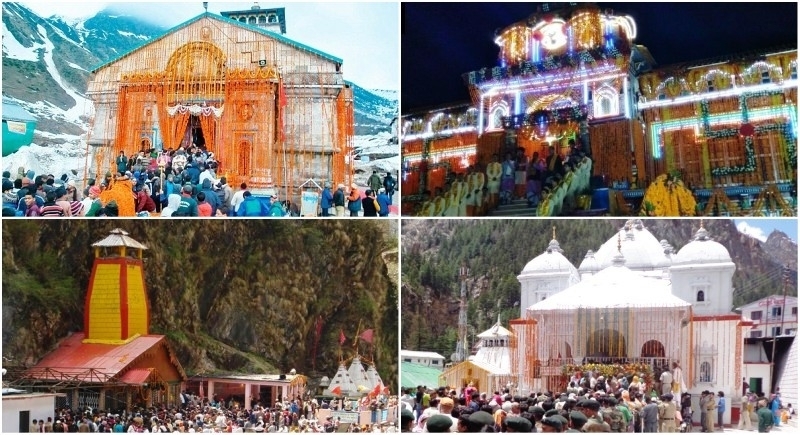 Dehradun, November 20: The portals of Uttarakhand's Badrinath Shrine have been closed for winter season amid chants and hymns on today evening. The shrine has been decorated with flowers for the closing ceremony which will be witnessed by a large number of devotees gathered for the occasion from India and abroad. The palanquin of the idols will leave for Narsimh Temple early tomorrow. Badrinath was the last shrine of the Char Dham Shrines to close for the winters after Gangotri Yamunotri and Kedarnath Shrines. The gates of the shrine were closed at 3.21 pm after special pujas were performed by chief priest Ishwari Prasad Namboodiri to the presiding deity Lord Vishnu in the presence of a host of temple committee officials, Badri-Kedar Mandir Samiti CEO BD Singh said. Soon after the temple gates were closed, an idol of Lord Vishnu, kept in a flower-laden palanquin, was taken to Narsingh Mandir, Joshimath, where the deity will be worshiped during winter. Over 5,000 devotees thronged the temple on the last day of the yatra season, including Yoga guru Ramdev and Uttarakhand Pradesh BJP president Ajay Bhatt, as its sacred gates were closed for winter when the temple remains snowbound, he said. A total of over 10 lakh pilgrims visited the Himalayan temple this year with 5,237 paying obeisance on the last day, Singh said. The Char Dhams of Uttarakhand experienced snowfall in the last few days with the temperature dipping down to sub-zero level.